Driven by our new goal of visiting all 58 National Parks (and getting those stamps) Tom and I set out from Seattle on a Friday afternoon in September 2010 headed to Bozeman on our way to Yellowstone and Grand Teton, two iconic National Parks. We make it to convenient Ritzville, WA, about four hours east of Seattle at the Best Western, our new favorite road trip hotel, making the 11 hour drive to Bozeman a little more manageable tomorrow. After arriving in Bozeman, we check into the Gallatin Gateway Inn which is a lovely old railroad inn from the 1930’s complete with nice grounds, pool, and a wonderful breakfast. It’s a fun and reasonably priced historical place to stay in the Gallatin Gateway area. This area holds sad memories for me having said goodbye to one of my best friends here before she passed away many years ago. We enjoy seeing my nephew, Taylor’s new college apartment and the MSU campus. Taylor chooses the Montana Ale Works for dinner which has better than average brew pub food - good going Taylor! After borrowing (and then buying) “Day Hikes in and Around Bozeman” from the front desk we select a hike called Hardscrabble Peak. We are happy that Taylor decides to hike with us today. It’s a good ½ day hike with wonderful views after reaching the 10,000 elevation level. Taylor and Tom both make it to the top, but the altitude gets to me. It’s great to see Tom doing so well hiking after getting his leg “fixed” following our Yosemite trip. Taylor also begins our education (which continues all week) about bears. The area has black bears (which can be brown) along with grizzly bears. Grizzly bears are larger, usually brown; seem to have longer/thicker fur, small rounded ears, a more rounded face, and a very distinctive hump on their back. They are much more dangerous than the black bears and it’s highly recommended that everyone carry bear spray which goes for about $50 a can! It’s also recommended that everyone talk, clap, or use a bell to make sure and not surprise the bear, especially a mother with cubs. Bozeman is a beautiful area, a haven for outdoor activities and a place we’d like to visit again. This is in stark contrast to the Butte area which appears to be less than a desirable place to live. Billboards that read “I used to have a daughter and now I have a prostitute” let us know that Meth is a major problem in the area. The mine that closed and still seeps polluted water into a large basin is a tourist attraction which costs $5 and yes, we went to see it. We say goodbye to Taylor, after completing our hike, and drive a couple hours southeast to Chico Hot Springs, also a lovely place complete with two non-smelly hot spring pools and attractive grounds. Rooms in the new wing are spacious and reasonably priced but there are other options including cabins with nice views of the valley. The dining room has surprisingly good food and a wonderful wine list. After enjoying the pool in the cool fall sunshine at Chico’s, we finally make it into Yellowstone Park on the fourth day through the North Entrance which is the original entrance to our Nation’s first National Park. The arch greeting us, built in 1872, is quite impressive but I can’t say that the town of Gardiner (just outside the Park) is. Our first stop is a walk through the steamy Norris Geyser Basin. Here we are surprised to see our first large bison walking right through all the steam! On our next stop in the wonderful Hayden Valley, a generous man lets us view a grizzly and her two cubs through his telescope. It’s amazing to gawk at all the bison (vs buffalo) which were nearly extinct in 1902. Only two dozen remained after the European settlers and the US Army poached the bison to help eliminate the tribes. Now they are thriving and the population fluctuates between 2300 and 4500 with two major herds, Northern and Hayden Valley, roaming around Yellowstone. It gives me hope that the Southern Resident Killer Whales (aka Orcas) in the San Juan Islands may someday experience the same turnaround. Unfortunately, the roads are quite congested with everyone trying to view and photograph wildlife – apparently, we are experiencing record breaking crowds! I made reservations too late so our route along with our accommodations are not ideal. In addition, there is a fire so the Roosevelt to Canyon Village road is closed which further complicated our itinerary. Tonight we are excited to be staying at Yellowstone Lake, the largest mountain lake above 7000 feet in North America, in what we thought was going to be the gorgeous 1920’s Yellowstone Lake Hotel. Upon arrival, our excitement turns to disappointment. The Hotel charges premium prices for their rooms but it doesn’t appear to be a luxury hotel to me anymore! The price doesn’t include breakfast, our room has a very small view of the lake and is old with minor attempts at remodeling. We are not impressed with the menu in the dining room and can’t get a table until 9:15. However, the lobby has a wonderful room to sit and view the lake. I begin to doubt the goal of visiting all 58 Parks. If they are all going to be this busy with people driving their cars clogging roads while viewing nature I am not sure that I want to continue. Next time, I would stay in the cabins at the Yellowstone Lake Lodge. In fact, we end up eating in the cafeteria there which has average food but a nice lodge feel. The porch is wonderful for coffee in the morning! Fishing Bridge, a former fishing hot spot along the Yellowstone River, is nice and sunny this morning – a perfect place to eat our cereal. Our next stop is the incredible Yellowstone Falls with a coyote viewing on the way. Uncle Tom’s trail, down to the lower Falls, includes 328 steep steps which I was not able to descend due to my thing with heights but our “Uncle Tom” does the walk and says the view is spectacular! The second day in the park we stay at Mammoth Hot Springs, originally Camp Yellowstone, where the US Army protected the Park until the National Park Rangers took over. The town has wonderful art deco type buildings along with brick out buildings that have all been beautifully maintained. It really has a small town square feel complete with a herd of Elk. This time we did better and had a cabin reserved which was totally renovated and quite comfortable, especially for the price. After we check in, we head out to the less crowded Lamar Valley which is in the Northeast corner of the Park. It’s truly a magnificent valley even better with the fall colors. Tom was successful while fly fishing (all catch & release) which really made his day! A herd of photographers, attracted by a black bear sighting, were as entertaining as the bear itself on our way back. This time our dinner experience is a good one. The dining room is pleasantly updated but in keeping with the style of the building. They don’t take reservations, but their pagers work well. Although busy and managed by Xanterra also, we were much more comfortable at Mammoth Hot Springs. We begin our day with a 1 ½ hour walk through the steamy Mammoth Hot Spring Terraces. These Terraces are unique with unbelievable white and orange “steps” created by the hot water that ascends the limestone deposits and then flows down over the formations. The Paint Pots weren’t nearly as interesting to us. One half of the world’s hydrothermals are in Yellowstone. Hot springs such as the Norris Geyser Basin are created by rain or snow, that falls in the area, and then seeps down nearly 10,000 feet into the cracks of the caldera and is heated to 400 degrees. This water, now lighter, creeps back to the surface creating the many hot springs in Yellowstone. Geysers are simply hot springs that have some sort of constriction near the surface. The steam builds up behind these constrictions and then forces the water to squeeze past the constriction and overflow from the Geyser. Mud pots, such as the Paint Pots are created where hot water is limited, and hydrogen sulfide gas is present creating both the rotten egg smell and the dissolving of surrounding rock which creates the bubbling mud pots. As we leave Yellowstone and drive to Grand Teton which is only a few miles away through National Forest Land, things calm down immediately. Grand Teton is just not as congested. During our drive we see our second grizzly bear and this time it is right on the side of the road feeding. It is a wonderful sight (safe from our car) but once again people block the road, so the rangers come and give tickets. 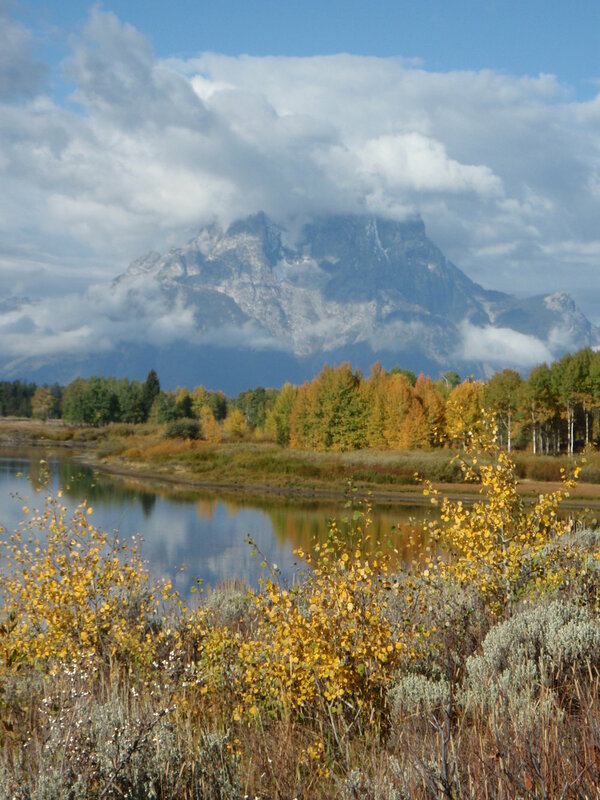 The Grand Tetons are spectacular beyond words, especially amid sunshine and fall color! We arrive at the Jackson Lake Lodge and immediately go upstairs to the incredible lobby just in time for sunset overlooking elk, grassland, the lake, and the Tetons. The Jackson Lake Lodge is wonderful. Although not built until 1955, it is registered as a historic place because of an agreement signed by Secretary of State James Baker and Soviet Foreign Minister Eduard Shevardnadze in 1989 that ultimately contributed to the end of the Cold War. Our cabin was super and was reflected in the price but the whole experience was well worth it. We treated ourselves to dinner in the Mural room which served smaller appetizer portions that were quite good. 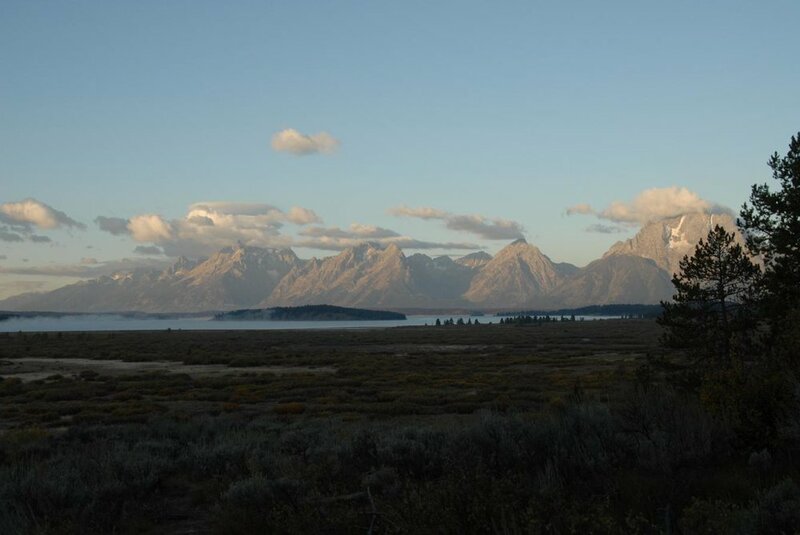 Tom’s day begins with photographing the sunrise over the Tetons while I sleep. After breakfast we take a nice five mile hike up Signal Mountain with more views of the Tetons. I wish we had more time to spend hiking and exploring the area, but we must be on our way. Following the hike, I purchase a bear bell because it is apparent that Tom is tired of all the clapping, singing, and talking required by me to feel comfortable in grizzly bear country after leaving the bear spray with Taylor. We get our stamp on the way out and head back to Yellowstone. We visit the Old Faithful Inn, which is quite impressive upon seeing the grand interior and learning how it was built. Lunch in the dining room is a nice event while waiting for the Geyser to go off (every 1 ½ hours). Seeing and hearing the Geyser is great fun- kind of like water fireworks! After having just read the review, in the New York Times, of the new visitor center, it was especially interesting to see. I’d agree with the review - it’s wonderfully designed and maximizes the view of the Geyser, but the exhibits could be improved, and I bet they will be over time. As we drive out of the Park, we get to view a harem of elk along with their large, full racked, bull enjoying the Madison River in the fall sunshine. We continue toward West Yellowstone, our destination for the night with a stop Tom has been looking forward to - fly fishing on the infamous Madison River! Once again, Tom was happy with his success both that evening and the next morning catching trout and whitefish. We stay at the Stage Coach Inn because Tom has in the past, but we left agreeing (at least that’s what Tom claims) that we won’t in the future. The rooms are average; breakfast is below average, for a price that is above average. 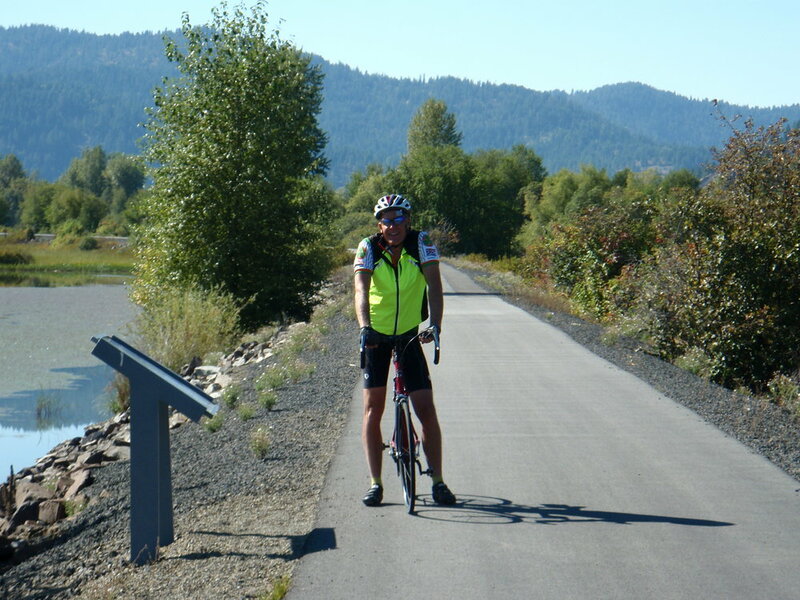 The plan was to meet friends in Yakima, for a bike ride. They couldn’t make it at the last minute, so we choose to take Highway 191 out of West Yellowstone instead – it’s a shorter route. We had seen a bike path across the panhandle (72 miles) of Idaho on our way to Bozeman and thought it would be fun to try it out. 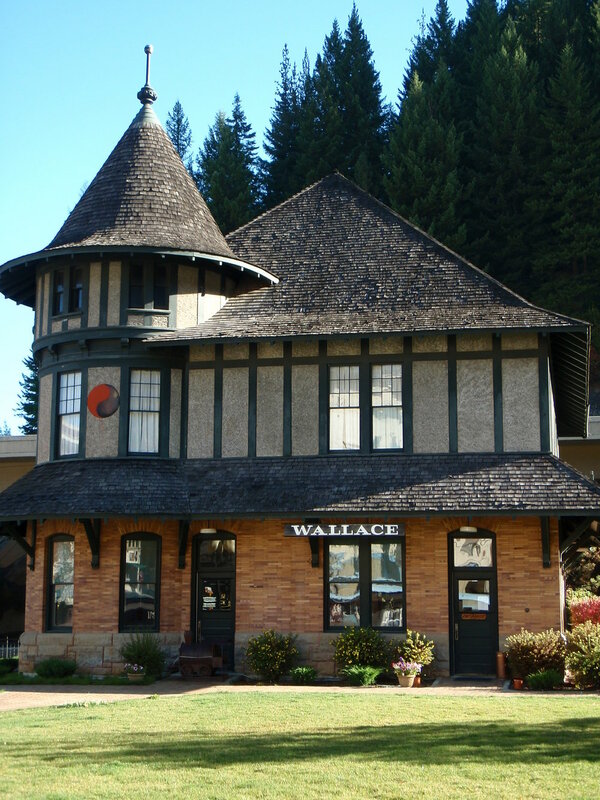 We find the historical town of Wallace. Tom had read, and I was reading the “Big Burn”. In 1910 over 3 million acres were burned in this area. This disaster helped to solidify the establishment of the National Forest Service. Today, the brick buildings built after the big fire and the remaining wood buildings west of town, have been nicely maintained or restored. The 1313 Club was perfect for a casual dinner. The new Wallace Inn worked out fine but the Stardust Motel, a well maintained 60’s motel, may be more fun for a cycling trip. After breakfast at the Red-Light Garage, the most unique and fun place I think I have ever had breakfast, we park at the Cataldo Mission Trailhead for the bike trail. We cycle out/back - about 50 miles. We love it! The path is in great shape, not crowded, totally flat with wonderful scenery and we hit it with perfectly sunny warm weather at the end of September. We even see a moose footprint. The one tourist stop I am sorry we miss in Wallace is the last brothel. The story goes that in 1988 it was finally closed down. Everything is still exactly as it was that day (the women left through the back door) with make up on dressers, cigarettes in ashtrays, and even services and prices on a chalkboard. Our adventure ends with a day to spare, two more park stamps (now 6 in total), and a renewed energy toward our 58-park goal. We now realize that all the discoveries we make along the way are as fun as the planned Park destinations themselves. Taylor can be sure we’ll come and enjoy Bozeman again and we’ve already talked some friends into a two day ride next fall on the bike path! This was our first trip after we established our official goal to visit all 59, now, National Parks. It was also the second blog I wrote long before travelwithjanice was established. I'd like to think the future blogs have gotten better, shorter and more story like after a travel writing class and practice. In April of 2018 I added some pictures and proper links to this post to make it a little more like the others. I hope you find it somewhat useful.